One Territory where '2.O' has been doing exceptionally well is North India. Hindi Version of the sci-fi thriller continued to earn double digit figures even on Weekdays. While Rs 13.75 crore was generated on Monday (Dec 3rd), Rs 11.50 crore were recovered on Tuesday (Dec 4th). Collections could be over Rs 10 crore on Wednesday and Thursday as well to help the film reach closer to Rs 150 crore-mark. The real test for '2.O' begins on Friday (December 7th) when 'Kedarnath' hits the screens. 'Kedarnath' stars Sushant Singh Rajput and debutante Sara Ali Khan. The film directed by Abhishek Kapoor is releasing with good expectations. Particularly, People are curious about Saif's Daughter Sara Ali Khan. 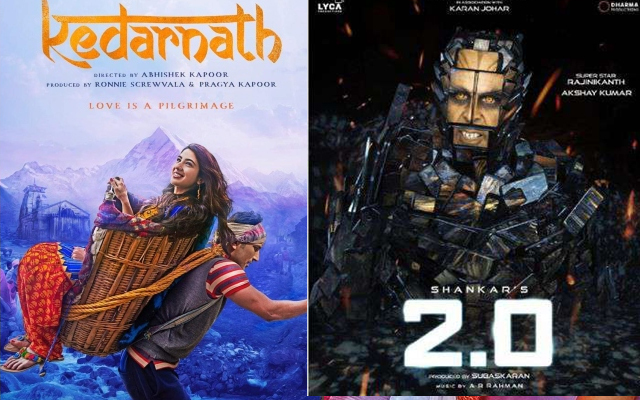 Trade Analysts say, 'Kedarnath' is like to earn Rs 6-8 crore on Day 1. From Second Day, Everything depends on Reviews and Word-of-Mouth. If it hits the bull's eye, There will be an impact on the revenues of '2.O' in the second week. In Telugu Circuit, '2.O' faces opposition from new releases 'Kavacham', 'Subrahmanyapuram' and 'Next Enti'. All of them hits the screens on Dec 7th itself and replaces the sci-fi flick in most of the theatres in B & C Centres. Sai Pallavi vs Sai Pallavi on 21st December!